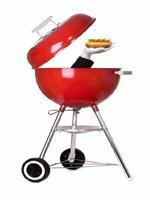 I'm very pleased to share the following BBQ Maintenance and Grilling Tips from my friends at eReplacementParts.com where you can find DIY repair parts for all major brands including their newly added line of repair parts for Weber Grills. Oh my. It's grilling season. Chicken, steak, kabobs, and my own personal favorites, grilled corn and asparagus, have arrived! Here in Salt Lake winter tends to linger into spring, then hits us early in the fall so when the weather's right for grilling, those of us who prefer cooking over open flames do so as often as possible. This Grill is Ready to Go! Whether you swear by charcoal models or love the control a Weber gas grill provides, these tips will help you make the most of your grilling season -- whether it lasts a few short months or the whole year round*. • Check your grill and chassis for rust. You can use a wire brush or steel wool to remove the rust, which will help keep it working for years. Another helpful tip is to prime and paint the chassis to prevent rust from accumulating in the first place. • Check for clogs in your grill's burners. You want even flame distribution for the best cooking results. If the burners are clogged, use steel wool and a flexible pipe cleaner to remove any gunk. • You can check your hoses for leaks using soapy water. Just coat the hoses using an old paint brush, and turn on the gas. You'll see bubbles if you have a leak, and you'll know which lines to replace. 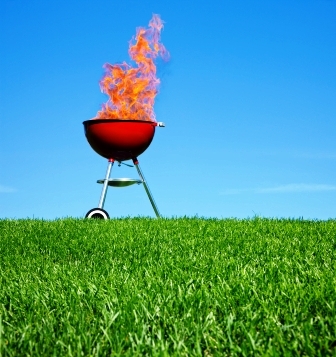 • Once your grill heats up, clean it before cooking using a grill cleaning brush. Then leave the food residue on the grates when you finish. The gunk will help prevent rusting between uses. Good Grillers never let this happen! • You can find a plethora of grill recipes here on tasteofBBQ or with a little help from Google. A lot of them will mention grill temperatures for different methods of cooking. Hot: You can hold your hand over the coals for only 2 seconds. Medium-hot: You can hold your hand over the coals 3 to 4 seconds. Medium: You can hold your hand over the coals 4 to 5 seconds. • This should go without saying, but if you handle raw meat, wash your hands often. Don't use a plate or tray that was used on uncooked meats for finished food. 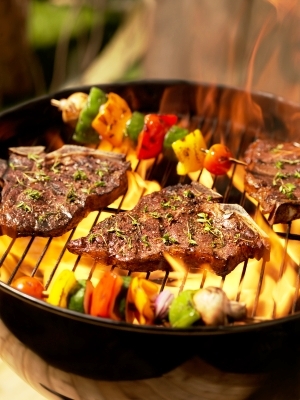 • Spray your grill grate with cooking oil to help prevent sticking--unless your marinade contains oil. Too much oil causes flare ups. • Never use a fork when turning meat. Tongs will do the trick and prevent piercing that can lead to lost juices. Then to guarantee those juices really stay locked in, let your meat sit (you can cover it with tin foil to keep it hot) for four or five minutes before eating. 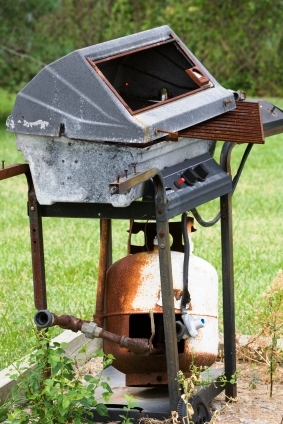 And of course, our last tip is to never throw away a broken grill. We have all kinds of grill parts that can get your gas or charcoal grill running like new again. eReplacementParts.com is the one-stop resource for all of your repair needs. Their extensive library of free repair information delivers expert advice that helps you get the job done with professional precision. They stock parts and accessories for a diverse assortment of products and manufacturers, including DeWALT, Makita, Briggs & Stratton, Black & Decker, Toro, Craftsman, Echo, KitchenAid, Cuisinart, Nordic Track, Garmin, Dell, Bissell, Dirt Devil, Eureka, and more. *Author's note: I mentioned that our grilling season here is a few short months. That's because that's when the weather's nice and you can grill in your backyard the same as a nearby park. Snow has never, ever, kept me from the grill. It just makes the experience slightly less amazing.